I have struggled with fear my whole life. I’m not sure where I picked it up. Maybe it’s something that is hard wired in me. If fact, I think fear is hard wired in many of us. Those who have overcome fear have had to work really hard at it. Up until my mid to late 20s I believed that failure under any circumstances was unacceptable. This limited my willingness to take reasonable risks in life, weather personal or professional. One of the great things about reading books and blogs is you get to learn from the life experiences of others. A common theme emerged once I started reading about successful individuals. Almost all had gone through at least one significant failure in their lives. While this is common knowledge to me now, I was mind blown at the time. How did I not realize this? There are so many famous failure examples. Thomas Edison was once told by a teacher that he was “too stupid to learn”. Oprah was fired from her first TV job. Michael Jordan was cut from his high school basketball team. Imagine if these individuals would have given up and quit. How many people destined for greatness actually have given up and quit in the face of failure? My change in attitude towards failure occurred right around the time I started taking an interest in personal finance in 2011. Coincidence? Probably not. I’m sure there was overlap as I started reading more books and listening to podcasts on related topics. This was also around the time I started to be more successful in my day job. Instead of playing it safe, I started taking more chances. After working in a similar role for more than four years in the same organization, I was approached with an opportunity. The safe thing to do would have been to stay put. I was good at my job and the opportunity at the time was a lateral move. The move came with uncertainty that would make me very unconformable for a while; and it did. What helped me get through the initial challenges and uncertainty with the new role? I started asking myself one simple question. What’s the worst that can happen? There is power in this question. It allows you to go directly to rock bottom and work your way back up to a more reasonable scenario. Even if I was really bad at my new job the likely worst case scenario was getting fired. That gave me a starting point. Yes, getting fired would have been a bad situation. However, I likely would have been able find another job. Maybe that other job would have been waiting tables or driving for Uber (wait, we didn’t have Uber back in 2011). More than likely with my background and experience I would have been able to find something more comparable to my previous role. Just thinking through this scenario in my mind significantly reduced the fear factor involved. The point is even the worst case scenario didn’t seem all that bad after really thinking through it. Though we were in a lot of debt back in 2011, it wasn’t so much debt that we couldn’t get by on the small amount of savings combined with other temp jobs. We most likely wouldn’t lose our house, go hungry, or something worse. As long as we have a roof over our head, food on the table, and a healthy family we knew we could get through anything. A few years ago we had one of our senior leaders retire within our organization. She had been with the organization for more than 20 years and was the original member of the team I was working on at the time. This group that started as an idea now had about 80 individuals on the team. During her retirement speech, I’ll never forget the advice she gave. “Come in every day and be willing to get fired for the right reasons”. She was basically saying we should all stand up for the things we believe in, and be willing to fight those things even if it means getting fired. If you have a strong financial foundation you can take this approach. If you are so dependent on your job that losing your it would mean losing your home, bankruptcy, or worse, then you may end up taking the safe route. Once I started to set a stronger financial foundation, I found myself being willing to take on more risk. I have volunteered for projects that had a lot of downside because there was equally a lot of upside. I have also fought for individuals who needed someone to step up for them even if it was the unpopular thing to do. Thankfully everything has worked out well even though the rewards have come with more difficult challenges along the way (which isn’t a bad thing). One final point here. Minimizing lifestyle inflation was a critical aspect of setting a strong financial foundation. Giving in to lifestyle inflation would have made the worst case scenario look much different. While our income has increased since 2011, our lifestyle has mostly stayed the same. You can read more about our story HERE. We were nearly $200,000 in debt in 2011 and heading down a path of taking on more debt. If we had a half million dollar home, expensive cars, credit cards, and other expenses I would have found myself taking the safe road more often. A worst case scenario without a strong financial foundation would look much different. Expensive mortgage payments would have quickly eaten through our savings. If unable to find a new job, losing the roof over our head would have been a real possibility. This exact situation played out for thousands of people after the housing crisis in 2008. I can’t emphasize enough how important minimizing lifestyle inflation is in general, whether pursuing financial independence or not. I have not mastered fear; not even close. However, I have gotten much better. I’m not sure if most people ever really master fear or if they just learn to power through it. 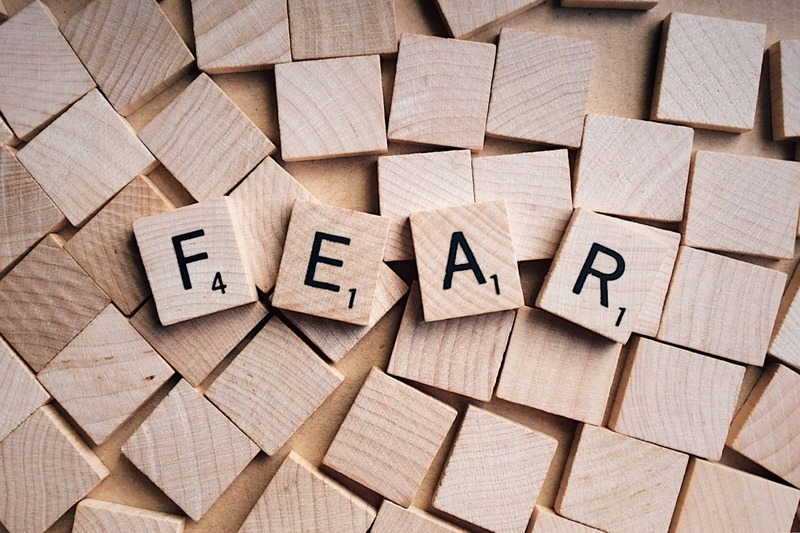 One strategy to power through is to look fear in the eyes and ask yourself “what’s the worst that can happen?” The next time you are contemplating a job opportunity, preparing for a speech, or doing anything that makes you anxious or uncomfortable, ask yourself this simple question. Visualize the situation. Really try to feel what it would be like. Let your mind go to the worst possible situation. Then really question the likelihood of that scenario. You’ll find yourself working back to a much better place. Fantastic! I really love the part about “minimizing lifestyle inflation.” One great life lesson my dad taught me was when you are married do your best to live off of just one income if both of you are working (basically just live below your means). Now as a stay-at-home mother we can take the risk of having just one income. If my husband wants to switch jobs, we have a strong enough financial foundation that we can do that very much on our terms. While worshiping money and worshiping financial success is ultimately unhealthy, recognizing the freedom that you really do gain when you have your “house in order” is a beautiful thing. Isn’t it amazing how so much of sound financial advice can be boiled down to just a few simple principles? Live on less than you make. Avoid debt. Save for a rainy day. Slow and steady wins the race. It makes me feel like a goof ball for taking so long to get it! Haha. I always say that personal finance is the easiest, hardest thing to do. The concepts are so easy, but the doing can be so hard! We have our second little one on the way and are thinking of going to one income. Any advice as we consider this transition? Excellent post and profound insights. I used to be so fearful that I would not try anything new. Then after a shift in mindset, I asked myself, “what’s the worst that can happen”. As long as you have good fundamentals, just start over. We live in a country where opportunities abound. I recently wrote a post about building ladders to wealth. If one falls down, just build it back up again. Good point about minimizing lifestyle inflation. Unfortunately, for me it is a real drag, living in Silicon Valley and having kids in private school. But if the worst happened, I’d just move and send my kids to public school. There are much worse things in life than that! We are fortunate to live somewhere where the worst that can happen often isn’t really that bad. I’m in the Midwest so it’s much easier to manage lifestyle inflation. We can live in a decent area for relatively cheap. Feel free to post link to your article on building ladders to wealth. Would love to check it out. Good question to ask yourself, FP! I need to ask myself this to conquer my fear of public speaking. Working on a post about it now. Public speaking is one of the toughest fears to overcome. This is one where the level of fear only seems to decrease with a lot of repetition. Starting small or even joining a group like toastmasters can make a world of difference. Looking forward to your post! I agree. It’s a powerful question that really changed the way I approached situations. Thanks for stopping by! I ask myself that question too – what is the worst thing that could happen. All we are doing is saving up more than we would otherwise. Surely that can’t hurt. Our plan is to leave our jobs after a preset period. Whether we get to FI or not. Ideally, we would be there – but it depends on the stock market, and how it behaves. If we have to, we will work part time, or find other jobs so that we can earn enough to just cover our expenses after that period. Until our savings grow to a point that we are FI. I love big goals! Good luck on your journey. It’s so inspiring to hear the stories of others making bold moves. Not only is “what’s the worst that can happen?” a liberating question, but the idea behind being able to come in to work every day with a willingness to get fired for the right reasons will make you stretch. It’s all about having the right mindset (and being financially set helps, too!). Yes! Great point. With smart risks usually comes rewards. Having a strong financial foundation allows for more smart risk taking. This is a neat article, fear of failure is something I find myself struggling with less and less as I get further into my professional program but now I have a growing fear of falling into apathy–which I honestly think is less productive than fear! Hopefully I can find a balance in between where I am still motivated to take the risk but have enough fear not to be apathetic. I think apathy can be a reaction to fear as well. Sometimes if we trick ourselves into not caring as much it can actually help reduce fear. A little apathy may be a good thing, but too much probably not. Good luck in your professional program. I’m sure you’ll do great! Very insightful, I’ll have to look at the root of my apathy harder now 😛 Great, more self-reflection! As long as you are growing personally and moving closer to your goals, then keep pushing forward!